Relax to the taste of Rich Dark Hot Chocolate. So good, you will not want to share it with others. The fine taste of Rich, Dark Hot Chocolate drink. Perfect on a cold day. Treat yourself to a cup of enjoyment today. See how the kids faces light up when you serve them the Premium Milk Hot Chocolate drink from Malcolm’s. Chocolate. You could think it's home made. The assorted flavours box is great when some like the Dark Chocolate while others enjoy the Mint, Orange or Light Hot Chocolate flavours. The mixed flavour box comes with 8 x 28g Hot Chocolate packets. Included flavours are Dark, Mint, Orange and Light. Please contact us for locations near you. What a great gift idea for friends and family! 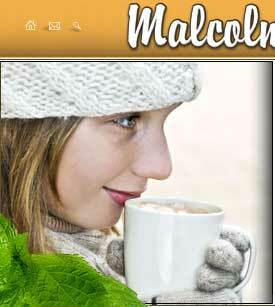 You can find all of the Malcolm’s Premium Hot Chocolate products at leading specialty stores thoughout Ontario. Taste the finest in cocoa beans, mint, orange and sugar ingredients. Malcolms uses the finest of ingredients. We have the highest standards in quality control assurance.